'Direct to Deck' refers to an installation method that, contrary to a batten system, affixes the roofing material to lay flat on top of the roof. 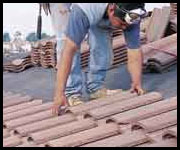 On roofs with a steep slope, tiles are usually fastened to battens. According to CemTile, most roof tile manufacturers allow direct nailing, but on roofs with a slope greater than 7:12 or on roofs in very cold climates where ice dams are likely, the tiles should be fastened into battens to ensure they remain fastened to the roof. In regions where high winds are common, roof tiles are usually fastened to the battens to prevent them from lifting from the roof deck.